According to the posters on the walls at work, April 27 is Take Your Child to Work Day. I guess it’s nice there’s an official day for this, but I celebrate my own Take Your Child/Children to Work Days. This is what it’s called when both parents need to be at work and there is no babysitter to be had. Fortunately, I work in a child-safe environment and have supervisors who don’t care how many members of my family it takes to do my job so long as it gets done. Per the fliers, our official Take Your Child to Work Day festivities are intended for children aged eight and up. This year I finally have a child who is old enough to celebrate the official holiday. Even so, I think we will be celebrating Leave Your Kid in School Day on April 27. He’s much better off in school. He might learn something useful there and he will be allowed to hold on to a childlike optimism for the future. Once upon a time, every day was Take Your Child to Work Day. 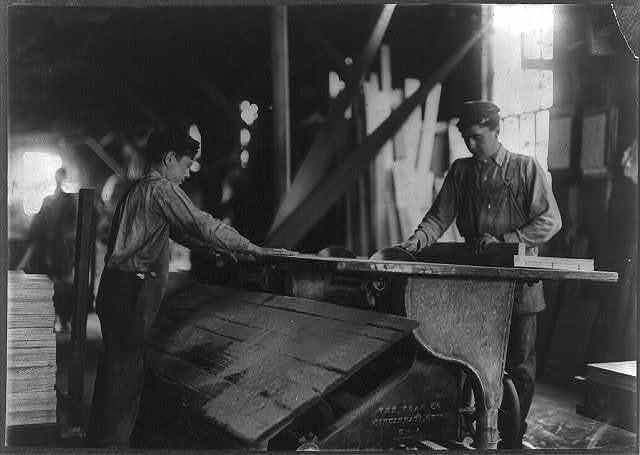 The excitement of working without safety regulations was too much for the children, so they limited it to one day a year. I infer from the guidelines that the organizers of Take Your Child to Work Day have studied the situation carefully and determined age eight is the time when children can really begin to understand the nature of grown-up work. This is a good piece of science to know; it tells me I should never bring any of my children who have reached this threshold to work with me again. My under-eight children are still okay to bring, unofficially, of course, because they don’t have the capacity to understand just how unexciting my work is. They still believe whatever Daddy does on his keyboard in his little cubicle sets events in motion to save the world. Small children are delusional like that. It’s cute. My eight-year-old son is now at the point where he can detect the pedestrian nature of paperwork and feel the repetitiveness of financial reports. Many jobs have a certain amount of repetitiveness in them and I’m not saying mine is worse than any other. I’m just not sure it’s the best end result to show a 3rd grader if you want to inspire him to reach for the stars in school. I’ve tried to think of how I could make my job seem exciting to a kid. 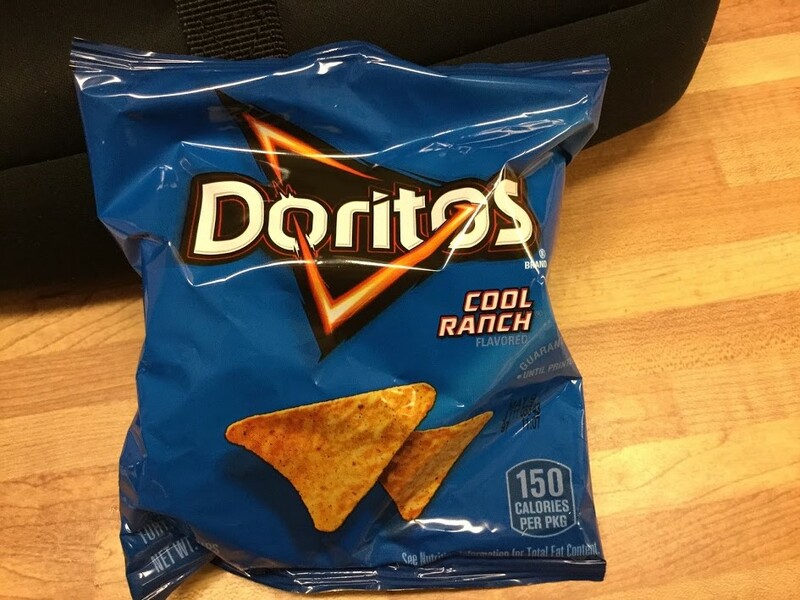 So far, the most enticing fact I could come up with is it brings home the money that buys the Cool Ranch Doritos. I’m still working on it. The fruit of my toil. All around my building are buildings filled with scientists. I’m holding out hope somebody will come up with Send Your Child to Work with a Nearby Scientist Day. Then the boy could maybe see how it feels to be a scientist discovering new isotopes. The only thing I can think of that might be more inspiring to him is knowing how it feels to be a scientist who discovers new video games. Christmas: Let’s do this thing! 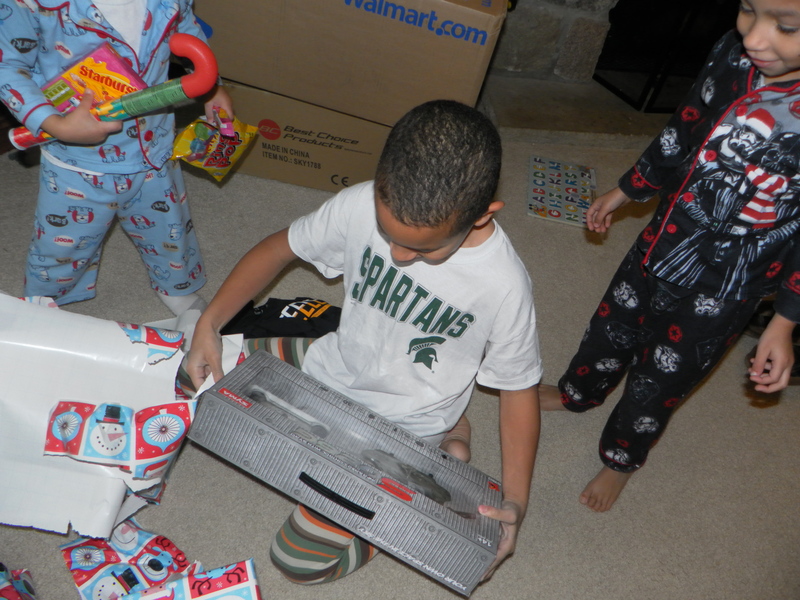 Christmas observations and tips from Big Brother, Buster, and Big Man for the enjoyment of boys and girls everywhere. Daddy didn’t run away from home on Christmas this year either. He threatened to do it two or three times like always, but we’ve been around this block before. He always acts like he’s headed for the door, but we all know he loves how exciting and noisy we make Christmas for him. Besides, he’s not going anywhere when there’s still a ham in the oven. And after dinner, he’s too fat and slow to escape. We brothers do our best to keep Daddy engaged on Christmas. He’s says he needs a minute of peace, but we know he’s just saying that so he won’t put us to any trouble. But it’s really no trouble for us to keep things lively for him. And since he’s almost a hundred years old, it’s important to keep his mind in the game. Keep your candy handy. You’ll need all your strength to rip open these packages. Daddy gets out his camera on Christmas morning when we’re getting ready to open presents. This is kind of like his little challenge to us. If he has time to take more than five pictures before the unwrapping swirls out of control, we haven’t done our jobs. That’s why we’ve all just got to pitch in and start unwrapping stuff. Daddy tries to keep us taking turns or something, but Santa didn’t put all these present under this tree so we could sit around and talk about them. It’s every man for himself. The best thing to do on Christmas is open up all the boxes with your new toys in them and dump everything out on the floor. Toys come with a lot of pieces nowadays and it’s important to get all the pieces together in one big pile. That way, when you and your brothers start hounding Daddy to assemble all your play sets, he’ll have all the pieces for any of them he needs in one central location. If you have anything that needs batteries (and you do – lots of things), make sure you bring that to your parents attention right away. It takes about 538 batteries to get through the holiday. Your parents will never learn this and will only have stocked up about 400 batteries, so you need to get as many as you can before your brothers hog them all up. Otherwise, you’ll be staring into a drawer with nothing left but those useless, rectangle batteries they used about a million years ago and Mommy and Daddy keep around for nostalgia. This is going to need batteries – lots of batteries. Here’s a fun fact about Christmas dinner: it’s a complete waste of your time. Wouldn’t you rather be playing? Even if you secretly like ham, pretend it’s one of the 9 billion foods you don’t. You’ve already loaded up on candy from your stocking, and if you get a little peckish later, you’ve still got a candy cane full of ROLOs and two caramel Santas in reserve. You don’t have time for a sit-down meal; protest it. Christmas is a time to stay wound up as long as you can. After all, you want to make special holiday memories for Mommy and Daddy. Putting up the Christmas tree with children is inspiring. In past years, it has inspired the Daddy to raise his voice multiple times, need a scotch break or two in the midst of decorating, and write a post summing up the entire misadventure. The boys must be getting more mature. This year I could count on two hands the number of times I had to yell at somebody, and I made it through the entire process without an ounce of liquor. I begin to wonder if the event merits a post at all. Well, it’s part of a tradition, and we’ve already lost the scotch break, so let’s just see if having conscientious helpers for once ruins the whole story. We have a fake tree, against which I expect the boys to rebel at each new season. This year makes another in which my expectations were wrong. They like the fake tree. Perhaps it’s because the tree needs to be built every year, like a construction set, which may seem like fun to foolish, young people. Also the tree comes out of a rather large box, the likes of which you don’t get to climb into very often. When your fake tree gets enough years old, it sheds needles just like a real tree. Part of me is concerned these boys aren’t clamoring for a real tree. That seems like what boys should do. But that concern is quelled when I think how convenient it is that I can fetch the tree in my slippers. It shouldn’t be surprising children don’t pine for a real tree, considering how much of the world they live in is virtual. Big Brother helped me assemble the branches of the tree. He was more help than hindrance, the first signal of the demise of my traditional scotch break and cooling off period. He helped me test the light strands, only neglecting his duties long enough to check in with the game he was playing on the computer. Buster and Big Man helped with the lights too, this year with the understanding that the main purpose of the strings was not to be used in a tug-of-war. Another nail had been struck into the coffin of my period of scotch and deep breather exercises. Working together in harmony, mostly. Once the lights were up, the boys hit the ornaments with gusto. Only this year they kind of, almost, sort of, nearly worked together as a team. Big Brother handed the others hooks from the tangled, rat’s nest wad of wire, they selected their ornaments and hung them all in a three-branch radius at the bottom third of the tree. Big Brother picked up the slack higher up the tree, and I, barely necessary any longer, placed one or two bulbs at the very top. A very popular, and easy to reach, spot for ornaments. Last came the garland. Buster and Big Brother were eager helpers, overcoming their instincts to strangle the tree in a shiny, boa necklace with minimal intervention. And just like that it was finished. They’d made a delightful tree. I’d needed neither alcohol nor soothing meditation. What’s become of this world? Children can smell Christmas a month away. The first sniff of it smells like Thanksgiving turkey. There’s something about that turkey, or maybe it’s Parade Santa driving down whatever avenue Macy’s is on, telling all the kids to rev up their engines for presents. Our three boys can be found roughhousing at pretty much any given time between New Year’s Day and New Year’s Eve, but there’s a special, over-the-top season of horseplay between Thanksgiving and Christmas. There’s something in the air that shoots right to their little, immature synapses and makes them start snapping in hyper drive. Big Brother, Yuletide veteran, knows how many days until Christmas. He lives in anticipation of that day. He knows exactly why he’s excited, but when it comes to controlling his frenzy like a civilized third grade citizen, he’s as helpless as a two-year-old. Fortunately, there’s a two-year-old nearby to emulate. Buster knows Christmas is coming, in a general kind of way. It could be in a few months or it could be tomorrow. It’s probably not tomorrow because there’s no Christmas tree yet. But Big Brother has been asking about putting up the tree, and he only does that within three or four months of Christmas, so it must be time to get amped up. It’s not enough to say, “I want that!” to every toy commercial on TV, you’ve got to shout it at this time of year, so people know you’re serious. 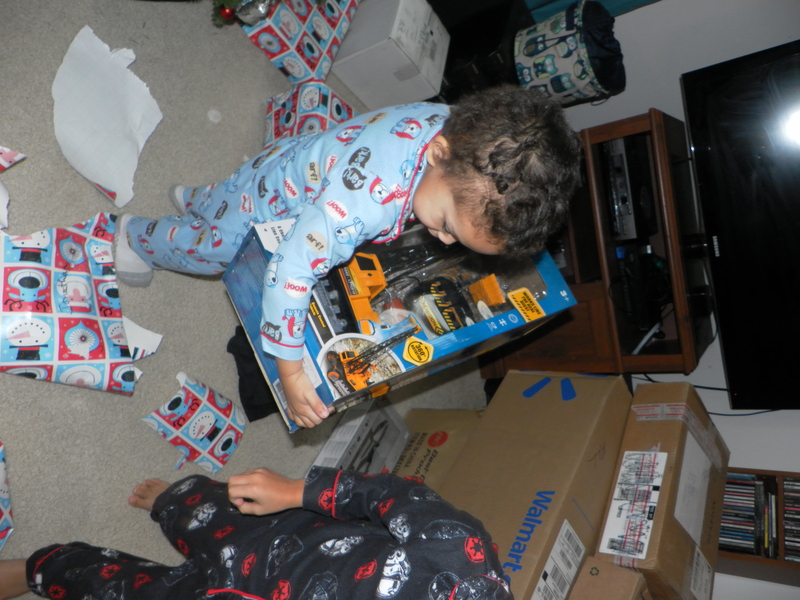 Big Man exhibits a vague sense of impending joy. He’s been seeing more lights, trees, and red suits lately, and that can only be a good thing. I doubt Big Man remembers last Christmas as a specific event, so he has the advantage of having it be the first time all over again. The disadvantage is that he doesn’t know the reason he’s feeling so hyper these days, but if his big brothers are running around like maniacs, there must be a good reason for it. And running around like maniacs they are, literally. Their race course is a narrow path starting in the entrance hallway, with a sharp left in the kitchen, a hairpin turn in the dining room, then between the sofa and an unforgiving book case back to the start. The days since Thanksgiving have been littered with stubbed toes, banged knees, and bumped heads as they chase each other around this treacherous course at warp speed. It always follows the same pattern: the sound of running feet is punctuated by a thud; all the running noise stops, replaced by one siren wail; the pitch of the wail slides down into the steady notes of crying; perhaps this is accompanied by the sound of a little person hopping on one foot as he stumbles toward expected parental sympathy. Who needs parental sympathy when you’ve got the Christmas Spirit? Those overstimulated baby synapses will wash away the tears and get a boy back in the race in no time.